So my plan said this was a down week in the run and bike, but up for the swim. Well, I did the number of hours the plan calls for, but not the right breakdown. My shoulder has been getting more and more sore from swimming. I've decided I should take a little time off from swimming and get some lessons. I managed one swim this week and as of yesterday, the Y pool is closed for 7 weeks while they do pool maintainence and gut the locker rooms. I can swim at the local University in the mean time, but it is a bit inconvienent. I'm looking forward to the new locker rooms, the old ones were.... old. I'll probably take this week off swimming. Next week we'll be on vacation and I'll try to find a pool to do some laps or maybe do some OWS in Florida. Not quite per plan. I missed my Tuesday night ride because of sound practice at church. I love mixing sound since I love live music and our band and vocalists are awesome. Anyway, I managed to get one ride in during the week and a long ride in today (42 miles, long for me). Had my first dog chase tonight. He was about 20 feet off the path and just watching me (medium sized dog, kind of boxer like but a little more stout). I figured he was gonna chase me, but I tried to make nice anyway. I said "hey puppy", he said "woof woof", and it was on. I was out of the saddle in a split second and he barked again and was off. He gave up after about 30 seconds or so. He chased just long enough to spike my heart rate, probably a good little addition to the work out. After about an hour, I dipped in to the food I had in my jersey and pulled out some Cliff Shot Bloks. I've never tried them and was looking forward to a change from my Gu Chomps. When I went to open them I see this ->>. 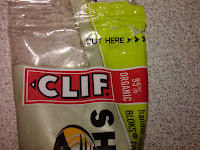 "Cut here" then proceed to gnaw at the package trying to open them (you can see the bite marks). No worries, I had a Hammer gel and a Cliff bar with me so no big deal. I don't ride with an Ipod due to safety reasons, I'm definitely not riding with scissors :-). My plan had my running only being a little over an hour this week. I need to start ramping for a half marathon on October 3rd, so I ran 6 miles a couple days before work (I'm not a morning person so this was a big accomplishment for me!). I planned to run 8 miles on Saturday, but by the time I was ready to go at 10 a.m., the heat index was over 100 degrees. When I left the house, I thought I would scale the run back to six miles or so, but 5 minutes in to the run, I knew that was too long so I cut it to three miles and threw in some walking. Some days it is better to call it early and live to fight another day. So this week was an hour of swimming, 3.25 hours of biking, and 2.5 hours of running. Following a plan is tough to do if you have a job, a family, and a life. Overall, I'm pretty happy with the amount of time I have been able to exercise while balancing life.